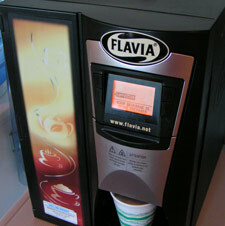 Our office rents a Flavia coffee machine. The idea is that every person can choose their own flavor from an assortment of packets and make individual cups whenever they want. 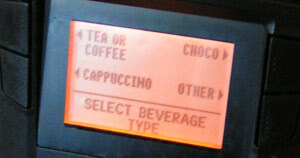 They also advertise this incredible machine's ability to make all sorts of other drinks with complicated Starbucks-like names, such as "Chococcino". This is great in an office, because people don't always want the same type of coffee. Plus, if you want coffee at 4:00 and there's none left, it would be a waste to make an entire pot just to drink a single cup. It's easy to use: just follow the menu. You place your cup under the spout, insert a drink packet into the slot, and wait for the water to squirt through the packet into your cup. That's about it. 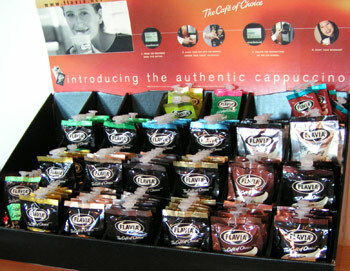 For cappuccinos and related drinks, you put the "cream" packet in first, then the coffee packet. Each packet costs about $0.35, depending on the distributor, in quantities of 20 or 100. This is very expensive compared to regular coffee pots. With an ingenious design decision, they also force you to use their cups, which hold about 9 ounces - regular foam coffee cups are too small and will overflow, while most larger cups are too tall and won't fit. It works... most of the time. Except when the water stream misses the packet, giving you a cup of hot water. Or when the empty pack gets stuck on the way out, making the next one jam the machine and require service with the vague screen message, "Error 328". Now, about the actual coffee: it's like very good flavored gas-station coffee. Most flavors are too bland to matter. You really have to give the writer some credit for these descriptions, though. As you read them, think about this: that's someone's job. Sumatra: More body, more boldness! Enjoy the exquisite richness of FLAVIA pure-origin Sumatra, direct from the volcanic soils of this exotic Indonesian island. While I doubt its volcanic origins, this is the only kind of Flavia coffee strong enough to produce a "cappuccino" in which you can actually taste the coffee. Italian Roast: Whether you are already assertive or want to be, this blend of darkly roasted coffees with a hint of caramel and spices gets you there. Despite the stereotypical implication, the Italian Roast tastes exactly like the French Roast. French Roast: A strong and intense, full-bodied coffee with a smoky flavor, made from our darkest roast Arabica beans. Neither strong nor intense, I can't detect any smokiness in this bland flavor. Espresso Roast: Give yourself a kick with this strong yet smooth espresso. Perfect with FLAVIA Creamy Topping for an authentic cappuccino or with Choco for heavenly mochaccinos. Wow, it tastes like... coffee! If you use this packet in an espresso, you can slightly taste it. Most people don't realize that espresso "roast" doesn't mean espresso: it just means that this coffee has a slightly stronger taste than regular (bland) American coffee. Espresso is a dense "shot" of coffee made from very strong, darkly-roasted beans. Density is its significant feature, not flavor. Espresso is considered the default coffee in Southern Europe, notably Italy and France. Ordering a coffee (un caffè in Italian) means ordering an espresso; this confuses foreigners in Italy and Italians abroad alike. What is considered plain coffee in the United States is normally not brewed in Italy. A similar alternative, an espresso mixed with hot water, is known as caffè americano. It is rarely ordered by Italians. Columbia: Pure-origin Colombia gives you full-bodied richness with a unique nutty twist. It's so unique that it tastes like coffee. No nutty twist detected. Costa Rica: Try this single-origin coffee from the lush Tarrazu region - full-bodied with an intense aroma and a rich, smooth taste. I think they choose three words at random from a list of meaningless adjectives when they can't think of any other distinguishing characteristics. "Try this (rich/bold/full-bodied/strong/smooth/assertive) coffee [from country] with a (rich/bold/full-bodied/strong/smooth/assertive) (taste/flavor/aroma/finish)." We haven't tried the Costa Rica variety yet, but I bet it's just as rich, smooth, and nutty as the others. Sidamo Gold: A complex coffee with a wine-like character and a deliciously exotic floral aroma. Perfect for multifaceted personalities and palettes. Look, some new words! Wine-like. (Can coffee taste like wine?) Floral aroma. Great for sufferers of dissociative identity disorder. This is next on our list of coffees to try. Who can resist the idea of drinking bitter brown flowers? House Blend: A medium-bodied blend of Arabica beans from East Africa and South America—carefully roasted for a rich, smooth taste and slightly fruity flavor. Breakfast Blend: A light-bodied, mild blend of coffees from the Americas and East Africa, distinguished by its delicate, refreshing flavor. Tastes like very weak coffee. Roasted Safari Nut: A unique blend of aromatic coffee, with the rich and warming flavors of sweet almond and creamy vanilla. Will have you humming "Hakuna Matata." Smells slightly like almonds - otherwise, tastes like coffee. Failed to deliver on musical inspiration promise. Hazelnut Noisettes: Go nuts with this smooth, creamy, mellow coffee with subtle Hazelnut flavor. Here, "mellow" means weak. But this is one of the only flavors that I can actually taste, so Hazelnut Noisettes has become part of our standard lineup. French Vanilla: A smooth operator - premium Arabica coffee combined with the creamy richness of Vanilla flavor. Very weak coffee with a very weak vanilla aftertaste. Irish Creme: A FLAVIA good luck charm - premium Arabica beans complemented with luxurious and velvety Irish Crème flavor. With another bad stereotype reference, it goes a bit over the top - I wouldn't call it "luxurious" or "velvety". In fact, I wouldn't compare any liquid to velvet. Velvet probably tastes like dust and dries out your mouth. But the Irish Creme has the strongest flavor taste - it actually tastes like coffee with artificial Irish Creme flavor syrup. This is better than the others, which taste like... coffee. Irish Creme is our favorite flavor. There are lots of different tea varieties. They're all too awful to finish even one cup. Avoid like the plague. Choco: Premium cocoa carefully blended to create a rich, creamy, European hot chocolate drink. Translation: Hot chocolate. But it's unsweetened, and you need to add cream and sugar. We have yet to find the elusive "perfect blend". The Choco packets contain much more powder than the others, resulting in a cloud of brown dust that condenses around the cup's inner rim. Creamy Topping: Combine with any coffee for a personalized, authentic FLAVIA Cappuccino. 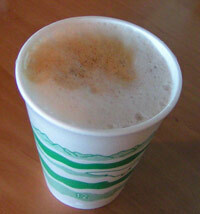 Add to Exotic Chai for a tantalizing Chai Latte! Marry it with Choco for a frothy Chococcino. The Creamy Topping tastes like white water. It's like powdered milk, but without the milk. It serves to dilute the drinks and make them sound more impressive. And I hope I never hear anyone say "Chococcino" in real life. It's expensive per cup. It's not very reliable. The coffee flavors are unimpressive, the cappuccinos are weak, and the tea is sickening. But I get a drink or two from it every day. The Flavia is mediocre. But it's better than the alternative at my office: drinking bulk pots of bitter coffee that have been sitting around for 3 hours from a machine that always needs a new water filter.